I can close my eyes and think of Lucille Ball receiving a florist box full of long-stem flowers from Ricky! Wow, what a presentation. The white box was tied with a large ribbon, and it looked like the flowers inside were 5 feet long. I am sure the long-stem beauties were normal size, but to a child, it was the essence of luxury. With every issue of our magazines, we wish to bring about that same sense of luxury for our readers. I hope you are enjoying hearing about the projects we are working on here at Hoffman Media. I like to share our ideas, projects, and plans with you. I love feedback and ideas for magazine articles and books. One of the main features in all our magazines that people comment on is the beautiful flower arrangements that we have in our stories. I love flowers, too. I love growing them and cutting them for bouquets in my home. 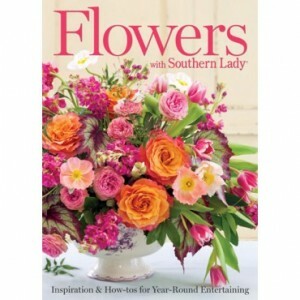 Southern Lady magazine’s Flowers book is a project near and dear to my heart. 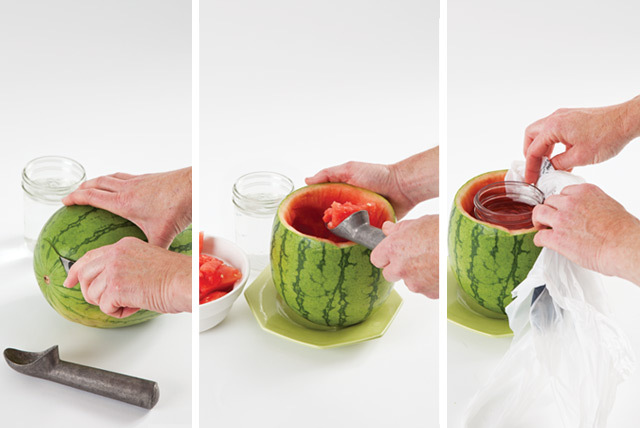 I love step-by-step photos so that I can learn like the pros. What fun! I wanted to share a photo from the book that really made me smile. The flower arrangements are all in white vases of various sizes but are low as centerpieces should be. Look at the rainbow treatment in the dishes and the flowers. 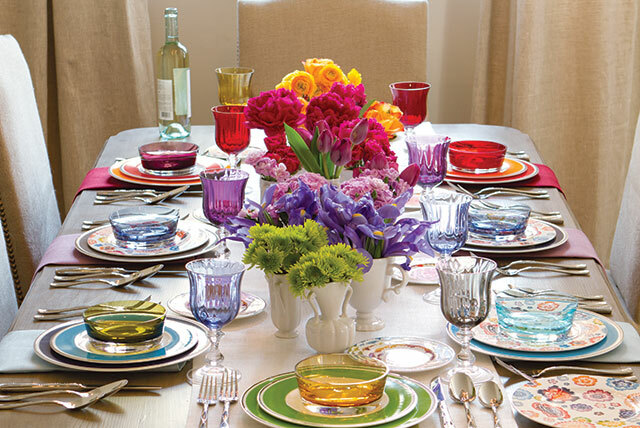 Colors are grouped with corresponding place settings and glasses, and I just think it is genius. The tablescape was the work of Tracey Runnion, the stylist for Southern Lady. What a wonderful idea to group colors together on the table instead of mixing the flowers. OK, I will share one more. I love my homegrown flowers right out of my garden. 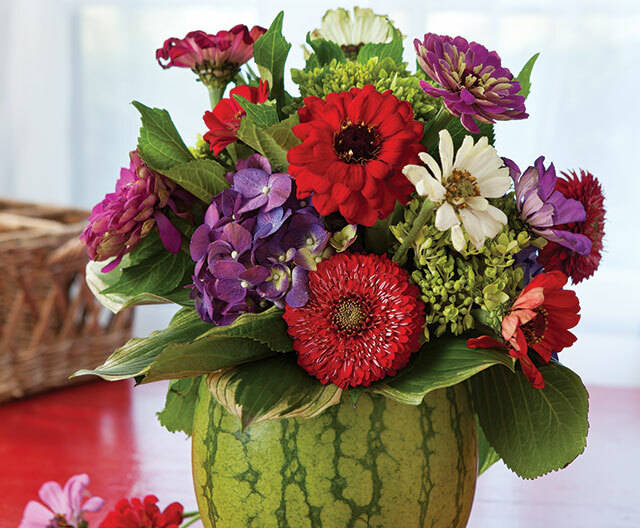 And with just a little carving, this watermelon vase holds my flowers perfectly. What is your favorite flower? 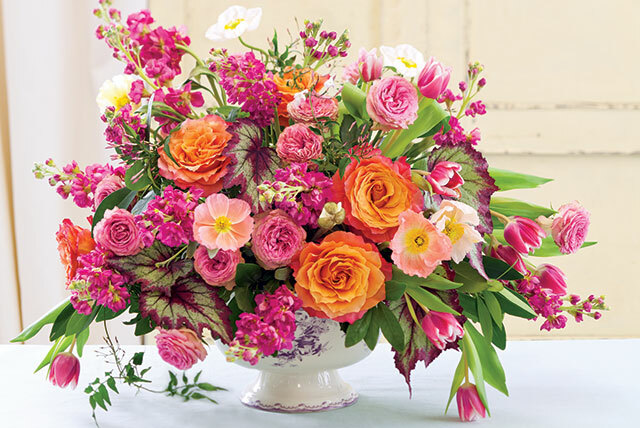 Do you have a special story about flowers your received or picked? Buy Flowers with Southern Lady Today! After reading your post about head vases & remembering the one my late Mother kept on her dresser, I was able to find one @ Canton Texas’s First Monday. She is lovely wearing beautiful pale blue & complete with pearl earrings & necklace. Another collection has begun. Thanks for sparking good memories. I cannot wait to add pretty pale pink roses! I love flowers and peonies, hydrangea, and roses are favorites. I look forward to May every year when roses begin blooming. My hydrangea are late blooming from July to the first frost, but I cannot seem to get my peonies to grow…definitely a black finger on those. Beautiful post, Phyllis and another “must have” book to add to my ever growing collection! I ordered my copy of Flowers with Southern Lady right away and so enjoyed flipping through the oages at that time. Now I am excited all over again to soak in each beautiful page. Phuyllis I am so happy to have found your blog and read about your family and how you started up Hoffman Media and rescued Victoria for us ladies who loved it from the beginning. Two brief flower memories. My mother loved flowers and roses were her favorites. She didnot like cut flowers at a funeral as they were soon dead and it pained one as a loved one was also dead. For her funeral (she died in florida where my borther and his wife lived) and I was there before she died and my sister in law was looking after things for my brothe. I told her mom would not appreciate a full casket spray of flowers so we did a half one and I since mom loved roses we used all different colours of roses. For the rest of the flowers sent she preferred (in the past) that they be given to the church and that is what we did for her funeral. There was a lovely, hugh, round wreath and my sister-in-law used it on her home door as the reception after the service was at their home. It looked lovely and inviting. For my mother-in-laws eightieth birthday we had a family picnic at my sister-in-laws and we gave (her favorite flower was also the rose) a bouquet of 80 multi-coloured ones and it was a big hit. I remember when gardenias were given to us young ladies by our beaux before going to a dance. They had such a wonderful fragrance and now we hardly ever see them. If I were rich I would have lovely flowers in every room! One of my favorite flowers are lilacs. They have such a wonderful scent and their smell brings me right back to my childhood. We had a huge bush right outside our back door and my aunt would go out and cut some and put them in vases throughout the house. When you walked in you would think you were in a garden. It was wonderful! Violets are my favorite and 2 maiden ladies, 3 houses down, had a side yard just full of them. I would ask her if I could pick them, thinking she would say no but she always came through for me. I must add they not very fond of children. Living in south Florida, I love to receive live orchids. They can remain in bloom for months. As soon as the flowers fade, I put them out in my yard. Nothing makes me happier than to see a new shoot of blooms beginning to form again. It is a gift that just keeps on giving year after year. I am always amazed at the resilience of these plants and the ease in their care. I remember the very first one given to me by my sister in law more than twenty years ago, still alive now and about to bloom again! She started me on this orchid obsession, and I will always be grateful to her. My son and his family gave me a beautiful orchid. I must learn how to grow them! First one I have had in years. So beautiful. Orchids like to be dry. I have 2 that bloom and 2 that don’t and they are treated the same way. A tip I have heard and use, is to put an ice cube on them every morning when they are blooming. Then water as usual. Have you been to Longwood Gardens in Pa ? Every year in March there is an “orchid festival”. If you are a fan of these beauties, you must go – amazing display of all types of orchids ! I remember the first orchid I ever received from my Uncle who was stationed in Hawaii at Easter time. My mom was awestruck. Today, I noticed that I can buy orchids at Winn-Dixie in a myriad of colors! that Hoffman Media puts out. 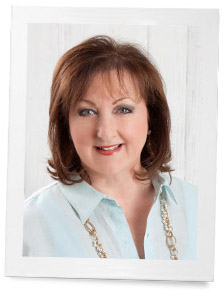 Phyllis, I enjoy all of your blogs! My husband and I share the love of flowers. Our back yard is in full bloom with irises daisies and ponies oh yes roses. Their is something about flowers that lefts the spirit, I couldn’t live without them. You are right about lifting the spirits with flowers. Up until all the kids on our street grew up and moved away our street was always ablaze with flowers. Then for some strange reason, new homeowners didn’t much care about flowers. Perhaps we should make it our mission to encourage others to plant some flowers in their gardens, especially ones they can eat! Thank you Marilyn. Your yard sounds dreamy. Beautiful post Phyllis, as always. I’m really enjoying reading your blog and am going to grab a copy of Flowers with Southern lady. I’m still a Southern girl at heart you know. Miss you! You are a dear. Miss you too! Phyllis, you are so right about long stem flowers in a box. I have been married forty-three years now and I can remember one year for our anniversary my husband brought home a beautiful white box with a ribbon around it containing three dozen long stem coral roses. They were beautiful and I felt like I had just been crowned Miss America! Remembering my feelings about receiving the box of flowers one year I sent my mother roses in a box for her birthday and she loved it and like so many of us she also really likes to arrange flowers. I feel it is so nostalgic from another time and as a woman I enjoy being showered with love. My Mom planted peonies at her “new home” in 1954, she died in 1997 and the family still owns the house and the peonies that bloom every spring to summer. When I was there I would cut flowers and put them in a vase, usually a bucket, and put them on the entry stairs so anyone who walked or drove by could see them. Let’s see, 1954 to 2014, still blooming after 60 years, we should all be so giving. Thank you for the memory. Now,THAT is a beautiful thing! Such great memories pop up. When we were very young and visit my great grandmother violets would grow wild in her yard and we would pick and she would put them in our ‘special’ little pitcher-vase. I have this little pitcher and remember her each time I look at it and remember how she smiled when we would bring her the flowers. Helene- must tell you a tiny story of my peonies- my dad has been ill since December and just this week we have put him in assisted living- without my mother. My grandson and I ( he’s 3 ) took my mother several peonies from my garden before we took her to the assisted living place where my dad is. I should have had the camera on my phone when we walked in with the bouquet- it was priceless and she was thrilled! It made my day! Soft and pink, big and blousy peonies are my favourite! Oh, and ‘waterfall’ fairy roses. BIG cabbage roses, too. And ALL hydrangreas. Did I mention foxgloves, hollyhocks, delphiniums, lupins? I think irises and day lilies also…Lol You see, I simply cannot live without flowers every day. 🙂 Thank you for the BEAUTIFUL images, Phyllis! My Waterfall fairy roses are new this year and are beginning their climb up the arbor. I love them! Thank you for sharing you garden joys. I do the flowers for our church every Sunday, and try to use whatever flowers are currently blooming in my garden (one must be VERY creative during Jan, Feb and March). The bouquets in Victoria always give me good ideas as well as simple enjoyment just from seeing the pictures. Carol, how inspirational to have fresh flowers in church each Sunday. Even in those cold months, I bet you find beautiful foliage or even bare branches that prove all of God’s creation is lovely. You are fulfilling your calling.